Shoulder replacement surgery, also referred to as shoulder arthroplasty, can help ease the pain and discomfort from shoulder conditions such as arthritis. Shoulder joint replacement surgery can improve the mobility and functionality of an arthritic shoulder. Shoulder arthroplasty is also performed to alleviate joint pain from a variety of shoulder conditions. What parts of the shoulder are treated during shoulder replacement surgery? The shoulder is comprised of 3 bones known as the shoulder blade, collarbone, and the humerus, which is the upper arm bone that connects from the top of the elbow to the bottom of the shoulder. The rotator cuff is a capsule of bonded tendons that supports the arm at the shoulder. Tendons are the body’s mechanism to attach muscle to bone using fibrous tissues. Muscles are able to move bones by activating the tendons. The rotator cuff is used to provide a wide range of motion to the arm. Part of the shoulder blade known as the glenoid comprises the shoulder socket. The portion of the shoulder blade that attaches to the shoulder is known as the acromion. A fluid-filled cavity known as a bursa is situated between the acromion and the tendons of the rotator cuff. Bursae are sacs of tissues that are well-lubricated to reduce the friction between 2 moving parts of the body. The bursa in the shoulder helps to reduce grinding between the acromion and the rotator cuff. 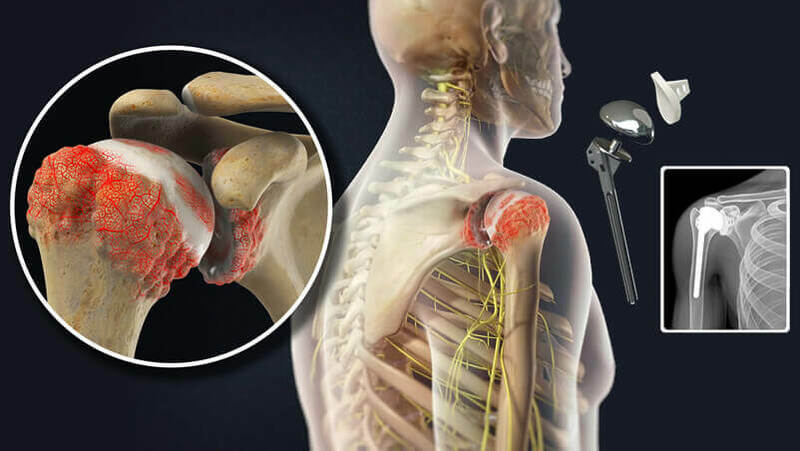 The ball of the joint within the shoulder is known as the humeral head, which is comprised of multiple blood vessels that enter at the base of the articular cartilage. This cartilage encases the ends of the bones in the majority of joints. This form of cartilage is slick, which helps the bones gently move over one another when in use. Articular cartilage can also absorb shock from a fall or accident. The shoulder joint itself is enclosed within the joint capsule, which is a watertight sac that lubricates the joints for proper mobility. The walls of this joint capsule are comprised of ligaments. The joint capsule is relatively lax, providing a large range of fluid motion in the shoulder. What conditions require shoulder arthroplasty? Shoulder replacement surgery may be needed for a variety of shoulder conditions. Shoulder arthroplasty can help reduce pain and increase the functionality of the shoulder and arm. Total shoulder replacement surgery helps patients experience a wider range of motion and reduces discomfort and inflammation. Common medical conditions that may require shoulder replacement surgery include arthritis, osteoarthritis, and damaged blood vessels. Multiple types of arthritis may affect multiple joints in your body. For instance, rheumatoid arthritis may affect the shoulder joint in some patients but can also affect any joint within the body. Shoulder arthritis can cause pain and limit arm mobility. If your shoulder arthritis does not respond to nonsurgical shoulder treatments or if you cannot use your shoulder for daily activities, Dr. Rozbruch may suggest shoulder replacement surgery to treat shoulder arthritis. One of the most common conditions that require shoulder replacement surgery, osteoarthritis occurs when the joint slowly degenerates over time. While osteoarthritis is more common in the joints of the knee and hip, shoulder osteoarthritis can develop and cause pain within the shoulder joint. In the majority of cases, shoulder osteoarthritis develops several years after a shoulder accident or injury. Uncommonly, osteoarthritis can even develop without a shoulder injury. For patients who have experienced a dislocated shoulder, they may also experience an unstable shoulder, which can slip and move more than a healthy shoulder should. This extra movement in the shoulder can cause damage to the cartilage and joints, which can cause osteoarthritis to form. Damaged blood vessels may occur after a shoulder fracture or accident that has damaged the surrounding blood vessels. While the bone fracture may heal, the damaged blood vessels may not heal properly. When the blood vessels of the humeral head are injured, they can no longer supply the humeral head with adequate blood supply, leading to a medical condition known as avascular necrosis. The term necrosis refers to the destruction of bodily tissue. Shoulder necrosis can cause arthritis to develop in the shoulder. If you are at a high risk of developing avascular necrosis, Dr. Rozbruch may suggest you undergo shoulder joint replacement surgery. In most cases, Dr. Rozbruch will attempt to treat your shoulder pain noninvasively, reserving joint replacement surgery as the last option to avoid undergoing unnecessary shoulder joint surgery. Osteoarthritis of the shoulder may respond well to anti-inflammatory medications. Pain relievers can also help reduce discomfort but will not relieve any swelling or inflammation. Injectable medications are also available that are designed to lubricate the affected joints to improve shoulder functionality and reduce irritation. Cortisone injections for shoulder pain may help reduce the severity of symptoms. Cortisone injections are a powerful medication that can reduce shoulder pain and inflammation. Physical therapy and specifically designed exercises can also help to alleviate tension and restore shoulder mobility. What should I expect before shoulder joint replacement surgery? Prior to total shoulder joint replacement, you may need to undergo a complete physical examination to assess your health and symptoms. A physical exam can ensure that you are a proper candidate to undergo shoulder arthroplasty. You may also meet with a physical therapist prior to shoulder arthroplasty in order to discuss post-surgery exercises and therapy sessions. At this point, your physical therapist can examine your current strength and symptoms to create a tailored treatment regimen for you. Additionally, your physical therapist may begin to show you various stretches and exercises for shoulder pain that you will do following shoulder surgery. As the day of your shoulder joint replacement surgery approaches, it is important to check with Dr. Rozbruch if there are any steps that you need to follow. The night before shoulder arthroplasty, you may not eat or drink anything after midnight. While the length of your hospital stay will depend on your rate of healing, the severity of your shoulder surgery, and other factors, it is important to bring personal belongings to stay in the hospital for a few days following surgery. What should I expect during shoulder replacement surgery? There are 2 main types of shoulder replacement surgery, including the cemented technique and uncemented technique. The cemented technique involves securely bonding your artificial joint with cement to the bone. The uncemented technique uses a mesh material between the joint and bone, which initiates bone growth to securely adhere the living bone to the artificial joint. Dr. Rozbruch can determine which shoulder replacement technique is best for your specific case. Each artificial joint is comprised of 2 main parts, including the humeral component and the glenoid component. 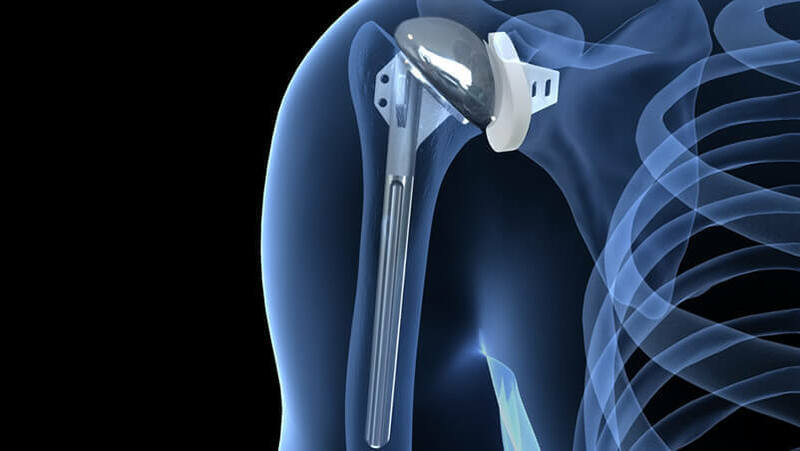 The humeral component is designed to replace the ball of the joint and is made out of metal. On the other hand, the glenoid component substitutes the shoulder socket. The glenoid component also has 2 parts, which includes the metal tray that bonds with the bone and a cup-like structure made of plastic that helps to form the socket. The plastic component of the artificial glenoid is designed to function like the articular cartilage of the shoulder. There are 2 techniques for shoulder replacement, including shoulder arthroplasty and shoulder hemiarthroplasty. In patients who experience complete degeneration of the shoulder ball and socket, shoulder arthroplasty may be required. Shoulder arthroplasty is a term given to a procedure that helps reconstruct the joints of the shoulder. Shoulder arthroplasty completely removes and replaces the humeral head and the glenoid of the shoulder to restore mobility and functionality. In cases where the glenoid is not completely degenerated, Dr. Rozbruch may opt for shoulder hemiarthroplasty, which only removes and replaces the ball of the shoulder. Shoulder hemiarthroplasty is more commonly performed, as shoulder arthroplasty is reserved for patients experiencing severe damage to the glenoid. Shoulder joint replacement surgery is performed under general anesthesia for patient comfort. General anesthesia is preferred because it is difficult to properly numb the shoulder with a local anesthesia. An incision on the front of the shoulder will be made to begin your shoulder hemiarthroplasty. The nerves, tissues, muscles, and blood vessels are gently moved to the side so that the shoulder joint is visible. Dr. Rozbruch will place an incision in the joint capsule in order to make the joint visible. Dr. Rozbruch will then begin to prepare the bones for the artificial joint by removing the ball-like structure of the humeral head. The internal wall of the upper humerus is then prepared to receive the artificial joint. The artificial joint will be placed and securely attached to the surrounding bones. After the artificial joint has securely been placed, the joint capsule will be sutured. Dr. Rozbruch will put any displaced bodily tissues, nerves, or muscles back to its original position. The incision will then be sutured at the end of your shoulder replacement surgery. You will have to wear a protective sling as your arm heals from shoulder replacement. What should I expect after shoulder joint replacement surgery? Following total shoulder replacement, your shoulder will be bandaged to promote a sterile healing environment. This bandage must be frequently changed in the days following your shoulder replacement surgery to prevent an infection from occurring. A drainage tube may be placed during shoulder replacement to remove any fluid or blood from building up within the joint. Following shoulder joint replacement, a continuous passive motion machine may be set up in your room. This continuous passive motion machine will gently move your arm and shoulder without you having to exert any energy. This passive movement can help reduce stiffness, pain, and scar tissue formation. When not using a continuous motion machine after shoulder joint replacement, a protective sling must be worn. How long does it take to recover from shoulder replacement surgery? Physical therapy following total shoulder joint replacement can help improve the mobility and functionality of your shoulder. Initially, your physical therapist will help you comfortably perform daily tasks following shoulder surgery, such as getting out of bed or getting dressed. Shoulder exercises can help strengthen your arm and decrease inflammation and pain. As you heal from shoulder replacement surgery, your physical exercises will gradually become more involved to improve shoulder strength and coordination further. How can I learn more about shoulder replacement surgery? To learn more about shoulder joint replacement surgery, please request an appointment online or call Dr. Rozbruch’s orthopedic office in NYC at 212-744-9857. Prior to an office visit, please fill out Dr. Rozbruch’s patient forms to expedite your first visit.